We are offering unique Packages for Umrah in 2019. 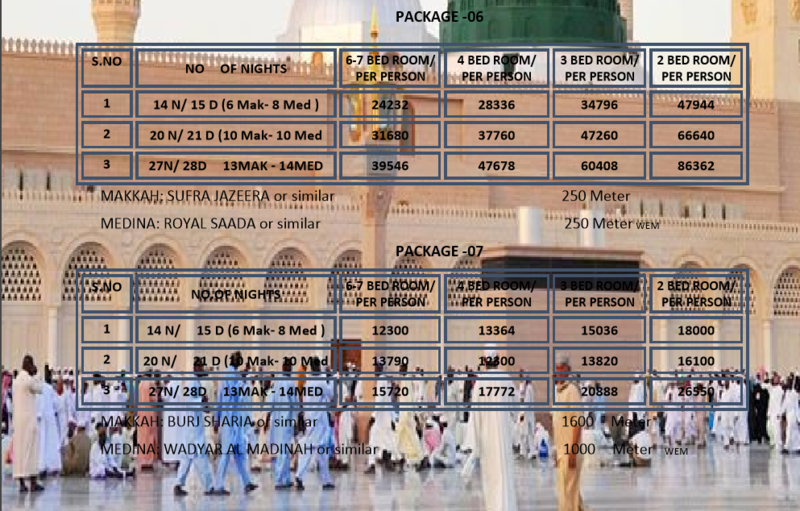 Margalla Hills Umrah Packages 2019 are the below listed for more details you can contact us on given contact numbers. Original machine readable minimum 8 months Valid. Any other necessary document required by Saudi Embassy necessary to provide. Health card & polio card child under 15 years. Sharing transport (JED, MAK, MED, MAK). Arrival intimation & voucher must be sent before 48 hours of travel otherwise 1000 pkr per person fine. Refund of sharing transport and accommodation is not claimable. Escape person fine 25000 SR per person. In case of cancellation or not travel visa rate will be charged. Visa charges Rs 13000 . Child / Infant without bed Rs 15000. Air tickets are not included in above Ramadan Umrah packages 2018. Ziarats of Madinah are Masjid-e- Quba (مسجد قباء), Masjid-e-Jummah (مسجدِ جمعہ), Masjid-e-Zarrar (مسجد الضرار), Masjid-e-Ghamama (مسجد الغمامة), Masjid-e-Abubakar, Masjid-e-Ali, Masjid-e-Umar, Masjid-e-Bilal, Uhad Mountain, Masjid-e-Qiblatain (المسجد القبلتین) and Battle of Trench (غزوة الاحزاب, جنگ خندق). Ziarats of Makkah are The Cave of Hira (غار حراء), The Cave of Saur (غار ثور), Jabl-e-Rahmat (جبل عرفات), Ayesha Mosque, Jannat ul Moallah (جنة المعلى), Masjid-e-Jin, Maqam-e-Ibrat (مقامِ عبرت) and house of Abu Jahal.